Years after its original release, Beyond Good and Evil is going to get a second chance to wow audiences. 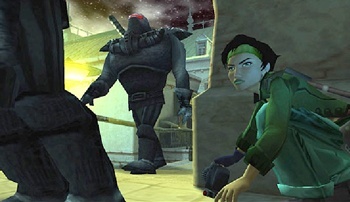 While Beyond Good & Evil got decent reviews when it was released in 2003, it never sold particularly well, and has been something of a cult classic. That may all change however, as the game gets an HD makeover for Xbox Live and PSN. The remake will have more detailed character models and textures, as well as a remastered soundtrack. It will also have trophies and achievements added, as well as online leaderboards. The actual gameplay and story are said to be untouched, so if you've got fond memories of playing the game, you're going to find it all very familiar. Just a bit prettier. In BG&E you played as Jade, a freelance photographer whose home is being attacked by aliens known as the DomZ. Jade finds that there is a lot more to the attacks than meets the eye, and soon becomes embroiled in the conspiracy at the heart of the war. The gameplay was a mixture of action and stealth, as well as some vehicle sections. There were also puzzles to solve and bonus cash to be made photographing the wildlife of Jade's home planet of Hillys. There's currently no release date set for Beyond Good & Evil apart from some time in 2011. If you can't wait that long, the regular version of the game is available on Steam right now.